These packages include the same behind-the-wheel instruction, but the classroom portion can be completed at your own pace online! This package consists of 15 hours of online classroom instructions, ten hours of behind the wheel session. All students must complete 15 hours of classroom, ten hours of in the car instruction, with a certified instructor to qualify for insurance certefication. Students will receive an insurance certificate upon completion. Estimated course completion time is 7 - 22 days. This package does NOT include a vehicle rental for the Road Test. If you wish to rent one of our vehicles for your Road Test, please make sure to let us know well in advance so we can reserve the vehicle for you. This package consists of 15 hours of classroom instructions, ten hours of behind the wheel session. All Students must complete 15 hours of classroom, ten hours of in the car instruction, with a certified instructor to qualify for insurance certefication. Students will receive an insurance certificate upon completion. Estimated course completion time is 7 - 22 days. This package does NOT include a vehicle rental for the Road Test. If you wish to rent one of our vehicles for your Road Test, please make sure to let us know well in advance so we can reserve the vehicle for you. This package consists of ten hours of Behind-the-Wheel instruction. Classroom hours are not included in this package. Behind-the-Wheel instructions are generally administered in five - two hour sessions. There is no certification for this course. Students must attend 15 hours of in class lessto receive a certificate. Estimated course completion time is seven to 15 days. We do offer car rentals for our students. If using one of our vehicles for your road test, it's best to book the vehicle prior to your road test date to ensure a vehicle is available. This package is designed for students who wish to improve their driving performance and driving habits before taking the road test. It is very helpful if students take this course a few days before his/her road test. Estimated course completion time is 7 - 12 days. This package includes 1 hours of In-Car instruction with a certified driving instructor and the Vehical Rental for the Road Test. 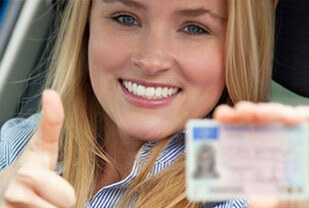 The most frequent and ideal solution is to use the driving instructor's car that you have been taking lessons in. When you start a course of driving lessons, it is often the case that you will take the practical test in the same vehicle as the lessons as instructors often use many reference markers, especially for the parallel parking . These reference markers are usually car specific and as each car is very different to drive, you will feel confident using the same car for the test.